A classic movie musical makes its Blu-ray debut. Inspired by Shakespeare’s great tragedy “Romeo And Juliet,” “West Side Story” revolves around two New York gangs (the Jets and Sharks) and a forbidden love between Tony (a former Jets member) and Maria (sister of Sharks leader Bernardo). Unlike the classic play, however, ‘Story’ is filled with classic song and dance numbers like “Tonight,” “Maria,” “I Feel Pretty,” “America,” and “Gee, Officer Krupke”. At the time of its release, “West Side Story” was a box office smash that wound up sweeping the Oscars the year it was nominated. It’s not hard to see why. The soundtrack is perfect (and is actually better than the film itself), the cast is superb, and the direction and cinematography positively make the film look epic and cinematic. Basically, it’s everything you could ask from a movie musical. Praise aside, however, the film does have its issues. Clocking in at 2 ½ hours, ‘Story’ runs a bit long due to some extravangant, over-the-top, drawn out (and sometimes cheesy) dance numbers. It’s a minor quibble in the overallpicture, but the film definitely feels a bit bloated at times. Summary: For musical lovers, “West Side Story” is as good as it gets. The thing that I was most curious about with this release was the picture quality. Unfortunately, it wasn’t quite what I hoped for. While the colors are impressive, there were some image issues. I noticed several flickering and wavy image problems that were a bit distracting. Also, I found the overall hi-def transfer to be somewhat uneven. It’s very clear that some shots look better than others here. The 7.1 DTS-HD audio track makes the film sound better than it ever has. The songs, music, and dialogue all sound flawless. * Commentary on all of the songs by Stephen Sondheim. Sondheim is strangely critical of some of his work here. Personally, I think he’s being too hard on himself or overthinking everything. * Music Machine isolates all of the song numbers so you can play any one at any time. * “Pow! The Dances Of West Side Story”- You can play these video featurettes about each dance number individually or with a pop-up mode during the mode. Lots of great facts about sequences here. 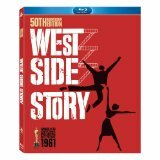 * 4 “West Side Story” trailers. * “Storyboard To Film Comparison Montage”- Speaks for itself. * “West Side Memories”- Cast and crew members chat about how the film came about, the music, the dances, behind-the-scenes stories in this 55 minute featurette. * “A Place For Us: West Side Story’s Legacy”- A 2 part featurette that covers the film’s uniqueness, the film’s visuals, the popularity and its impact on pop culture.